Dr. Ali performs both outpatient and inpatient surgeries. Outpatient surgeries are performed at either Golf Surgical Center or Lutheran General Hospital and is usually performed arthroscopically. This is a minimally invasive surgical technique. Small incisions are made around the surgical site to place portals for instruments and a special camera called an arthroscope. 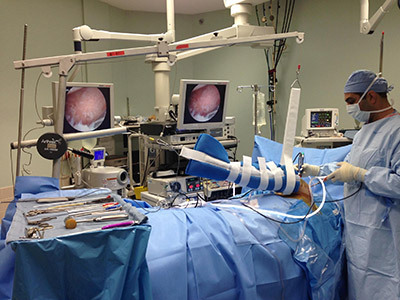 Once these are in place, the surgical site is visualized on a monitor set up in the operating room. The incisions are usually ½ of an inch in length and heal quickly after surgery. Patient will go home the same day and will be given oral pain medications to control any discomfort. A few examples of common procedures that are done arthroscopically are: rotator cuff repairs, meniscus repairs and ACL injuries of the knee. This is a surgical technique that involves making an incision over the surgical site to expose the area that is being worked on. After surgery, the incision is closed with one or more layers of sutures. Patients typically stay overnight at least one night in the hospital after open surgery. They are given pain medication through an IV. After their hospital stay, they will be given oral pain medications and will either discharge to their own home, or a rehabilitation center. Common open surgeries include joint replacements and repair of fractures.